The Nestle Compat Sandoz Balloon Gastrostomy Tube 18 FR Case of 5, Model #8741800, is anchored in advanced science and research. Nestle Healthcare Nutrition offers nutritional solutions for people with specific dietary needs related to illness, disease states or the special challenges of different life stages. 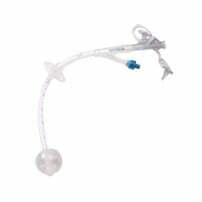 The Nestle Compat Sandoz Balloon Gastrostomy Tube 18 FR Case of 5 was developed with Nursing Input for Long Service Life. All Compat Replacement Balloon Gastrostomy Tubes are packaged sterile. The tube has special features to simplify care and maintenance. The Stretch-Lok Strap secures the feeding administration set to the tube, and its extra-large side port permits the use of catheter-tip syringe to flush or administer fluids. Available in a variety of sizes to meet your enteral delivery needs. Durable balloon provides longer service life. Flow-thru tip designed to reduce clogging. Sliding retention disc with aeration holes that reduce exit-site irritation ridges that grip the tube shaft to prevent inward tube migration. External graduations and radiopaque stripe permit precise monitoring fo tube position. Clear silicone allows visual monitoring of formula flow.